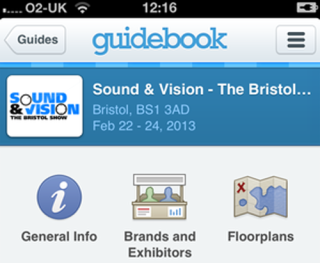 Bristol Show app now available to download | What Hi-Fi? A handy app has been launched for the Bristol Show this weekend, which should allow you to plan your visit a little more easily. The app, available for free on Android and Apple devices, has a list of exhibitors and where you can find them plus detailed maps of the various floors at the show. You can make a To Do list of brands to visit and all of the data is accessible offline ensuring you won't need to rely on a data connection when you're at the show. The Sound & Vision Bristol Show runs from Friday 22nd to Sunday 24th of February, showcasing a whole host of brands and new products, with special offers on products available at the show. More details on the app and how to download it are on the Bristol Show website. You can buy tickets online now at a discounted price and get more details on exhibitors in our Bristol Show 2013 blog.